Currently on display is a selection of artworks related to the ballet and opera productions at the Bolshoi, provided by the theatre itself. To walk behind the scenes of the Bolshoi Theatre and peer over the set designer's shoulder while he is designing the decor. To catch a glimpse of what others won't be able to see until opening day — that is a dream for many theatre lovers. At the Dom Naschokina gallery, one can get very close. Currently on display is a selection of artworks related to the ballet and opera productions at the Bolshoi Theatre, provided by the theatre itself. Also included are some works from the private collection of fashion historian and flamboyant television host Alexander Vasilyev, whose father was a renowned set designer in the Soviet Union. The artworks, spread over different showrooms in chronological order, take you through decades of Bolshoi productions and allow you to see its creative development through the ages. The exhibition is a deceptively tranquil array of scenery used as backdrop for opera and ballet. Inanimate costumes such as the dress that Galina Ulanova, said to be one of the best ballerinas of the past century, wore during her performance in ‘Romeo and Juliet’ in 1946, seem cold and abandoned at first glance. But this is just an illusion, since all of the displayed costumes once starred in a thriving Bolshoi production. The decor drawings, model stages, artwork and costume sketches were all forerunners of a show yet to come. “The exhibit shows not just the Bolshoi Theatre, but it portrays the history of our city over the past 160 years,” he added. This does not mean that the exhibition should be seen as merely a retrospective of the bygone days. The shows have already happened, but the hundred-year-old drawings convey the anticipation of creating these spectacles, the task of creating the enchantment that the Russian ballet still fulfils. It all begins with the sketches that the Bolshoi artists make, which are fully completed artworks on their own. Take, for instance, the beautifully detailed 19th century watercolours. On some of them, the miniature actors have already taken over the stage, making the canvases seem like secret windows through time. Gallery director Natalia Ryurikova emphasized that the collaboration of many sculptors, painters and designers was needed to complete a single show. “The designer's role is only partial,” she said. “It arranges the composition, the costumes and the atmosphere. The artist creates the essence of the performance. He is the base upon which all the rest is build.” Ryurikova said she was very pleased with the collection that Dom Naschokina has on display. “It is my dream that one day all of the Bolshoi arts collection will be put on display in one big exhibition, but this is a start,” she said. What makes the collection particularly interesting, besides the obvious grandeur and notoriety of the Bolshoi, is the position that the theatre has held within the culture of all European ballet and opera. Set designers from other cultural centres, including Italy, Germany and France, all came to the Bolshoi Theatre to work together. In the basement of the gallery are more contemporary productions. Here you will find video footage, photographs, stage models and sci-fi like costumes from performances that date until 2012, verifying that 21st century developments have not gone unnoticed by Bolshoi artists. And with this, the exhibit shows its relevance to present day. “The way it was, the way it is, is the way it will always be. 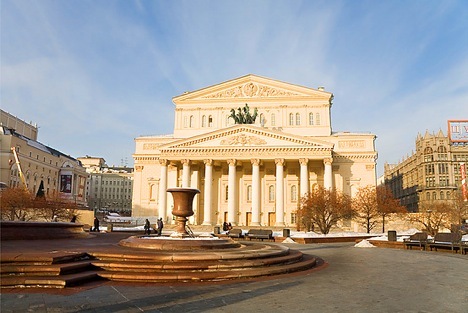 The Bolshoi Theatre is a kernel of joint talent and artistic force,” Ryurikova said. The only thing that might disappoint is that you are not allowed to actually try on the costumes. If that is what you would like to accomplish, the gallery's masterclass on the ballet tutu offers a solution. To be held on March 26, the masterclass takes 2 1/2 hours and is preceded by a tour around the gallery, explaining the history of the ballet costumes. And if you don't like ballet? “All ballet is more interesting than American film,” Barchin said. “Although, perhaps, not as interesting as football,” which leaves you with only one excuse not to visit the gallery.